Cape Town - New Zealand lost two wickets for 33 at tea, still facing a deficit of 269 on day two of the first Test against New Zealand at Newlands on Thursday. Skipper Brendon McCullum was unbeaten on 17, after facing 60 balls, and Dean Brownlie was yet to score. Martin Guptill succumbed to Dale Steyn in the first over of the innings, clipping the ball to Hashim Amla at midwicket for a duck. The other wicket to go was top-scorer from the first innings, Kane Williamson, who gave a regulation catch to Alviro Petersen at second slip, off the bowling of Jacques Kallis - introduced into the attack for the first time in the match. South Africa declared just after lunch on 347 for eight, with a lead of 302 runs. This after the Black Caps had capitulated with just 45 runs on the board before lunch on day one. Picking themselves up after what was possibly the worst day in New Zealand’s Test history, the Black Caps took to the field on Thursday and were rewarded with the early wicket of Alviro Petersen. On 103 overnight, Petersen faced four deliveries before Trent Boult struck with his first ball. It nipped back a fraction and Petersen got an inside edge onto his stumps. His innings of 106 came off 176 balls and included 11 fours and a six. Faf du Plessis got an outside edge to Chris Martin which flew to Kane Williamson at gully and the batsman departed for 15. A loud cheer greeted Dean Elgar’s first Test run, after he made a pair on debut against Australia in Perth last year. Skipper Brendon McCullum missed an opportunity to ask for a review when Elgar, on 18, played across a full delivery from Boult which hit him on the pads. Replays showed the ball had hit him plumb. Elgar continued to scratch around for his 21 runs before Boult got his man, giving BJ Watling an easy catch behind the stumps. AB de Villiers brought up his 30th Test half-century in 88 balls, scoring 11 boundaries, and went out on 66 after walking across his stumps, leaving them exposed to Martin’s delivery. Vernon Philander joined Robin Peterson at the crease and with the declaration imminent, Peterson (5) flicked the ball square for four and tried to do the same with the next delivery. However, when Martin’s accurate delivery removed the middle stump, captain Graeme Smith gave the signal to end the innings. 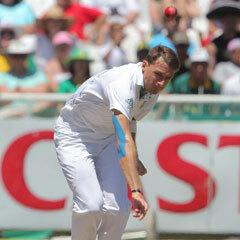 Martin returned the best figures, bagging three for 63 while Boult took 3/78. Doug Bracewell and James Franklin shared the remaining wickets. Graeme Smith (captain), Alviro Petersen, Hashim Amla, Jacques Kallis, AB de Villiers (wicketkeeper), Faf du Plessis, Dean Elgar, Robin Peterson, Vernon Philander, Dale Steyn, Morne Morkel. Martin Guptill, Brendon McCullum (captain), Kane Williamson, Dean Brownlie, Daniel Flynn, BJ Watling (wicketkeeper), James Franklin, Doug Bracewell, Jeetan Patel, Trent Boult, Chris Martin.